Q. Do I have to be a member of ACNA to be a member of the Florida club? A. No. 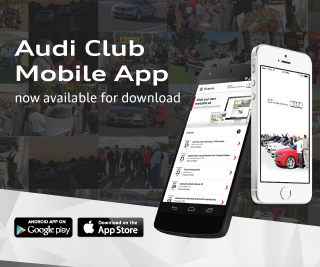 Membership in the Audi Club of North America, is not mandatory for Audi Club of Florida membership. Q. Do I have to own an Audi to be a member of ACNA or of the Florida club? A. No. There are numerous individuals which belong to the ACNA that do not currently own Audi vehicles. Q. Where does the Audi Club of Florida usually hold their membership meetings? A. Club meetings are held at a variety of venues, based on the specific event or meeting format requirements. Q. Can I bring my children/spouse/partner to events? A. Yes. All are welcomed, and encouraged to attend Club meetings and events. Q. Do I have to pay fees to attend your meetings? A. No. Standard Club meeting attendence is free. When a special event is sponsored by the Club, a contribution may be required to help defray associated costs. Q. Are there opportunities in the club for me to race my car? A. Use Your Audi To Its Full Potential! All have seen this before but if you are not already a member of the ACNA or your membership has lapsed, make sure to either join or renew. Two of the more valuable benefits aside from the camaraderie are that as a member in good standing, for starters there is that $50 price reduction to a non-members cost of admission to Audi motorsport events such as Sebring and Petit LeMans. Then of course, there is the $500 membership loyalty rebate upon the purchase or lease of a new or CPO’ed Audi. As with anything good, there are a couple of restrictions here, so check it out athttp://www.audiclubna.org/about-acna-topmenu-33/membership-benefits-topmenu-61/546-member-benefits. Spend $49 for a membership, be an active member for 6 months prior to your vehicle purchase or lease, then receive $500 from AoA/ACNA. That is an excellent investment, not only by purchasing a vehicle do you get your membership dues back but an additional $451, and you receive a magazine to boot. 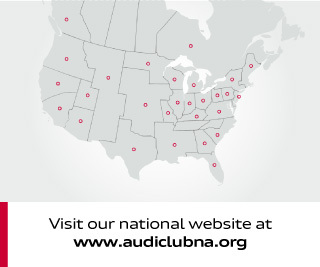 It is easy to become a member of the Audi Club of North America (ACNA), which can be done on line athttp://www.audiclubna.org/forms/acna-join.php. Visit the Audi club Florida Chapter web site at http://www.audiclubfl.org/and you will find additional details regarding the many events and numerous advantages associated with participation in our Chapter activities. If you are presently not a member of the ACNA, own an Audi and would be interested in joining the club, drop me a line at bob@audiclubfl.com Let’s see if we can get you a complimentary one-year membership. A. We will have three two-year positions open on the Board of Directors of the Audi Club of Florida and if you are a member in good standing of the ACNA, have the time and an interest in serving, elections will be held at the end of November period. Your pdf formatted and not to exceed 450 word autobiographies will need to be submitted to bob@audiclubfl.com no later than October 30. As we continue to improve the operation of the club, we are looking for folks that will bring some expertise and involvement in areas such as web site maintenance and development, newsletter creation and management, event planning and execution, and membership recruitment. So bring your experience and enthusiasm to the table, become involved, run for the BoD, and make it a better club to serve the needs of the Florida Audi owner and enthusiast. If you have any questions or would like a sample of an autobiography of one of our present BoD members give me a shout at bob@audiclubfl.com.